Students created 'neural cookies', where they were invited to create neurons out of edible bits. Students also participated in a 'neural dance' where they learned and rehearsed the parts and functions of the brain. In the days that followed, students could be heard singing and seen re-enacting parts of the dance as they recalled the parts of the brain. 'Brain surgery' quickly followed. 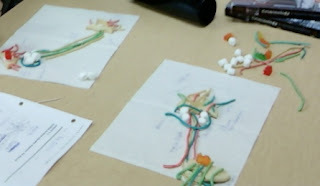 Using an orange to represent the brain, students attached and embedded materials such as straws, candies, etc to represent the different parts of the brain. Students then assessed their own understanding of the brain's lobes, areas and functions by using an interactive online program featuring a drag and drop tool. Students' interests then shifted to the effects of drugs on the brain. Students chose a specific drug to research and designed their own way to present their findings in a manner that could be understood by their classmates and other students. The students seen below researched the effects of heroin on the brain and baked their own 'brain cake' to represent a healthy brain and a heroin-addicted brain. The students also created a Prezi, 'Heroin: Chasing the Dragon" to help educate youth about the dangers of heroin. These examples demonstrate what students are capable of when allowed the opportunity to be creative, set their own directions and take ownership of their learning. In the video below you can listen to the students reflect on their own learning process.